Technology entrepreneur Elon Musk made the unusual choice of vetoing “boring” questions during Tesla’s latest earnings call. The electric car maker posted a record quarterly loss of almost $710m (£523m) for the three months to March – more than double the same period last year. However, following a series of probing financial questions posed by analysts, Mr Musk decided to stop answering. “Boring bonehead questions are not cool. Next,” he said. 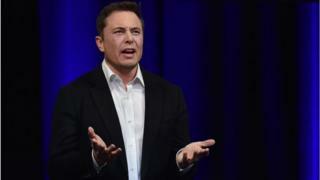 Instead, Mr Musk – Tesla’s chief executive – took questions from YouTube vlogger and journalist Galileo Russell who was listening to the call. Mr Russell hosts a YouTube talk show called HyperChange TV, dedicated to the financial side of Silicon Valley technologies. Mr Musk encouraged Mr Russell to keep asking questions, because they focused more on technology, rather than business matters. Analysts, however, indicated they would remain focused on the business details. After the call, Toni Sacconaghi of Alliance Bernstein, one of the people whose questions that Mr Musk dismissed, published a note saying the earnings call “raises more ‘boring’ and ‘not cool’ questions than it answers”. While he said Tesla’s quarterly results were largely in line with expectations, the firm’s efforts to increase production of its Model 3 car continue to “feel like a work in progress”. Mr Sacconaghi also deemed reaching profitability in the second half of the year “a somewhat unlikely scenario” despite Mr Musk’s optimism. Tesla’s shares were down more than 5% in late trading in New York on Thursday. Efraim Levy, an analyst at CFRA, described Mr Musk’s behaviour on the call as “erratic” and “impolite”, but said the fall in Tesla shares was an “over-reaction”. Instead, he said investors should be focused on the firm’s bottom line and ability to deliver on its promises. The passion that Tesla inspired, both among fans and critics, also means many investors were unfazed by Mr Musk’s attitude, he added. “The people I speak to, like shareholders… the ones that already hold it are usually willing to make the bet that he will deliver,” he said. Tesla is struggling to produce enough Model 3 cars. In the last week of April, it made just 2,271 cars, but needs to increase production to 5,000 a week to be profitable in the second half of 2018. Tesla told investors it had encountered manufacturing problems after adding “too much automation too quickly”. As a result, Model 3 production was suspended in mid-April in a planned shutdown and the company expects a total of 10 days of downtime this quarter. Revenues jumped 26% to $3.4bn in the first quarter of the year, but the electric car maker continued to burn through cash in the first quarter. Tesla said it would cut capital spending this year to less than $3bn.